Each cycling route during your Adelaide Bike Tour will be tailored specifically for your bike riding ability and experience, you can have a challenging ride or a comfortable ride, the choice is yours! Sports drinks and nutritional supplies are always on hand to keep the legs turning as well as mechanical and first-aid support for any unforeseen occasion. The Practice Bicycle team have a world of cycling experience available to you, allowing each ride to be perfectly paced so you can appreciate the scenery, take some photos or if you wish to be challenged take on another climb or two! Below is an example itinerary including just some of the 30+ exclusive rides Practice Bicycle has developed in and around Adelaide! Welcome to Adelaide, our personalized service will collect you at midday from Adelaide Airport followed by a short transfer to your deluxe accommodation in the heart of the city. Having checked-in to your accommodation we are available to assist you with un-packing your bike and should time permit the opportunity for a gentle ride along the river Torrens to stretch out the legs from your travel and to ensure that the bikes also travelled safely! Adelaide City is surrounded by green parks and our ride show cases this beautiful Australian City with the Torrens River separating the City and North Adelaide. The perfect introduction and welcome ride down under welcome to Adelaide! This evening we invite you to join us for Welcome Drinks and Dinner ‘a surprise’ at one of Adelaide’s cosmopolitan Restaurants. A great time to talk about our fantastic week ahead with the best ride routes and relaxing café / lunch stops on route each day. The town is named after Robert Norton, who arrived in South Australia shortly after its proclamation, and made the first recorded climb in the area in 1836. It is well known for the popular Scenic Hotel, founded in the 1870s, often considered one of the best pubs in Adelaide and perfect for a café stop. Magnificent picture postcard view amongst the vines and cherry orchards before we get lost in a forest… for lunch. With a variety of superb riding on offer during your ‘cycling down under’ bike trip, why not a trip from the City to the Sea! Adelaide’s sand and surf are virtually inescapable when experiencing the very best of South Australia from meandering esplanades to beach side cafes your never too far from this pristine coast. Today we enjoy the flat coastal roads with this morning’s adventure showcasing the typical Australian beaches. With white beaches this morning it has to be green vines this afternoon, contrasting colours of the unique Australian landscape. This afternoon enjoy a vehicle transfer south for a relaxing lunch amongst some of the finest vineyards in the world and the McLaren Vale region. Your premium ride this morning as we wind our way out of Adelaide and experience a taste of the beautiful Adelaide Hills with Gorge Road. This route with gentle slopes slowly winds you to the Kangaroo Creek Reservoir, as we pass by wonderful names that could only be Australia, Cudlee Creek and Chain of Ponds. The uniqueness of the Aussie landscape allows us to keep the pedals turning, don’t forget to keep your eyes peeled for the animals of this beautiful country as we pass by Adelaide’s wildlife park on our ride into the Northern Adelaide Hills.. Lunch is calling amongst the serenity of Adelaide and you certainly don’t want to miss the ‘Aussie Tucker”! Recovery Day in the saddle! Pedal pure enjoyment! Today is the perfect opportunity to ‘soft pedal’ on the comfortable coastal roads to Seacliff. Pristine beaches, coastal nodes, unique rugged coastline and seaside charm. Enjoy the coast this morning, this afternoon enjoy a vehicle transfer north for a relaxing lunch in the famous Barossa valley region of South Australia. Let’s head to the township of Nuriootpa, an aboriginal word meaning meeting place. Where Maggie Beers Pheasant Farm Restaurant will delight you. Maggie is one of Australia’s iconic cook, food author and restaurateur. 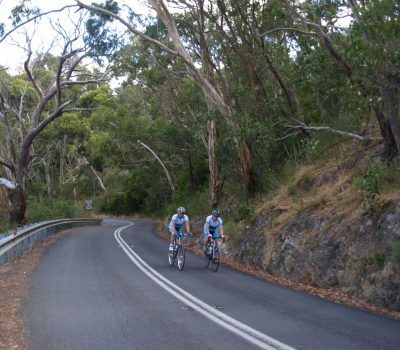 For those looking forward to discovering amazing cycling roads during the week, today it’s the panoramic views from Mount Lofty picturesque old world lanes amongst wonderful natural trees,. Enjoy the charming towns of Stirling which is the true essence of the Adelaide Hills. Also the German township of Hahndorf, a trip back in time… a beautiful day spent pedaling with a taste of Adelaide’s best on route. If you’ve come to Australia’s best cycling destination for quality bike riding then Mt Lofty here we come! It’s been an amazing Aussie adventure and the very best ‘cycling down under’ absorb the views one last time on your return to Adelaide. With your adventures drawing to a close this morning we say goodbye from Practicebicycle and are available to assist you with your onward travels. We will transfer you to Adelaide Airport this morning and wish you bon voyage and continued fun with your Australian travels. Explore the unique countryside of south Australia with this unforgettable bike tour. Adelaide is the ideal environment to relax and unwind whilst experiencing the very best bike ride routes on your Australian cycling holiday.